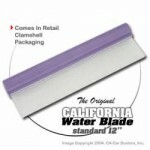 The Original California Water Blade!© removes water quickly, cleanly, and efficiently. It will mold itself to almost any contour, and dries the surface in one pass. The Original California Water Blade has many unique properties such as the 2-3/8" x 12" long blade that is made of medical grade silicone, one of the most gentle and smooth substances available. The combination of the flexible silicone and the patented T-Bar edge makes the Water Blade the most versatile and efficient drying device available. 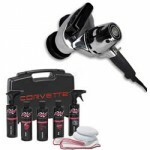 Virtually eliminates messy chamois and towels. Pros: California Water Blade is a darn convenient car care tool and, generally, does a better job at drying a car. Cons: The only problem I found with the Water Blade comes when trying to dry large, concave curves. One of several interesting products I found last month at the Specialty Equipment Market Association (SEMA) Show is the “Original California Water Blade”. Made by the same company that sells the “Original California Car Duster,” the Water Blade is a sort of high-tech squeegee you can use to dry your Corvette after washing it. Actually “squeegee” doesn’t describe this tool properly because, when most of us think about a squeegee, we think of one those old rubber things used by window washers. The Water Blade uses the squeegee idea, but it’s more technologically advanced and designed specifically for drying automotive finishes. The wiping blade of this device is made of medical-grade silicone rubber with a T-bar edge which allows it to wipe in either direction. The medical silicone is very soft, so as not to scratch the surface being dried but is also very durable to resist tears and scratches. The folks at California Car Duster Company sent me a Water Blade to try and I’ve been using it for several weeks. I find it significantly decreases the time I spend drying my Corvette and my other cars. Also, because there is much less friction using the Water Blade compared to a towel or chamois, the job requires much less effort. Lastly, I don’t have to wash and dry a bunch of towels after the job is done. The California Water Blade cannot be used to dry the entire exterior, but it does most of it. Before switching to the Water Blade, I used up 2-3 towels doing my 71 Coupe or my 95 Coupe. Now I use the California Water Blade for most of the drying job and a single towel for detail work around emblems, windshield frame, tail light cavities, gill vents and other nooks and crannies. Some people might be hesitant to use the Water Blade because they’ll fear it’s edges would trap very small pieces of dirt that could make tiny scratches in the paint. This won’t happen as long as you wash all the dirt off the car and your rinse water is clean. Also, you stand far more of a chance scratching the car with a towel or chamois than you do with the Water Blade because towels and chamois, even after they’ve been washed, hold tiny specks of dirt in their surfaces. The Water Blade’s silicone T-bar edge does not trap dirt. The only problem I found with the Water Blade comes when trying to dry large, concave curves. While this device is designed to conform to shallow recesses and concave curved surfaces, if the concave curve is deep enough for the edges of the Water Blade’s plastic handle to contact the bodywork as you push the tool into the curve to wipe the water away, the handle can mar where it contacts the car’s finish. Any mars are easily removed with a cleaner/wax. While this does not negate the Water Blade's value as a car care tool, I do feel it warrants caution when using the Water Blade to dry deep concave or recessed areas. While you need to use care with the Water Blade in a few drying situations and you still need a towel or chamois for minor finish-work, the California Water Blade is a darn convenient car care tool and, generally, does a better job at drying a car.